We sell fresh pork sides. Pork sides are cooled and transported to the client. Our pork sides are characterized by a very high quality and meatiness. Offered by our company pork sides is the highest quality pork ready to be divided into parts. We store the meat in cold storage, which ensure its freshness and we have our own fleet, allowing us to provide a half-carcase directly to the customer. 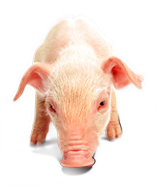 In addition, we also offer pigletss imported from our farms in Denmark. We invite you to familiarize with full offer of our company.